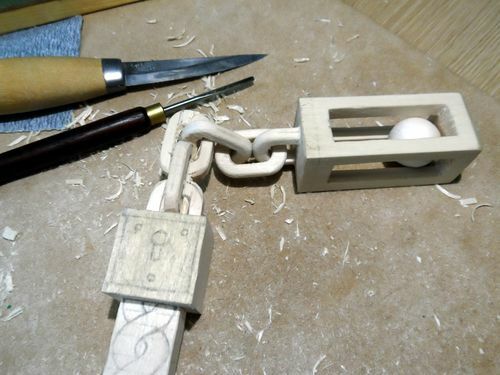 I was going to do the padlock next after roughing out the chain, but once I started on the chain I was enjoying myself so much that I just kept right on going. 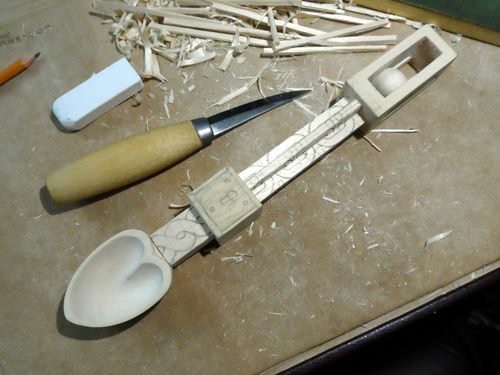 If you remember, this is how the spoon looked at the end of the last session. 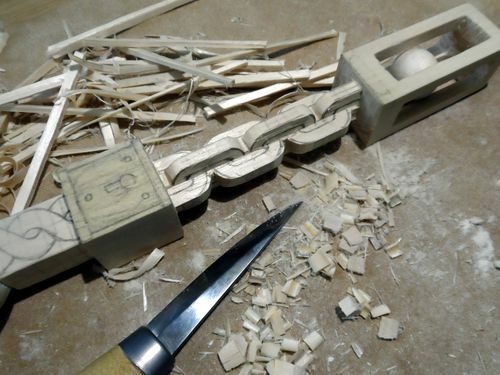 Work on the chain section began by paring down each of the four surfaces to the finished width of the links. Then I drew the edges of the links on each of the four faces. Next I removed the four corners leaving me with a ‘+’ cross-section and drew in the links on the newly exposed surfaces. …which was shaping the ends of the links with my knife. Now for the first time it was starting to look like a chain, albeit a very rigid one. After that it was just a case of carefully slicing away at the waste until the first link was free to move. The sharp point of the Mora 106 knife really came into its own here. I also used a 1/16” 60 degree V-tool which you can see in one of the photos below. 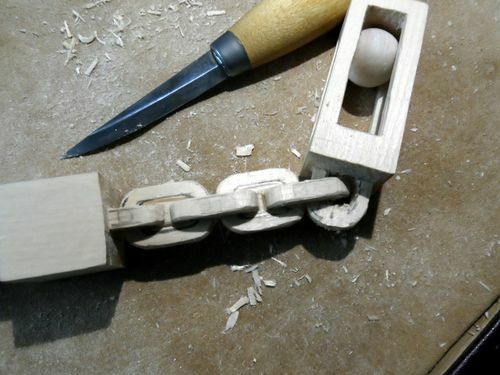 As each link was released, I took the opportunity to sand any rough edges so they wouldn’t catch and possibly break the chain. Below you can see the small Peter Benson V-tool I used to help excavate the waste in the direction of the grain. 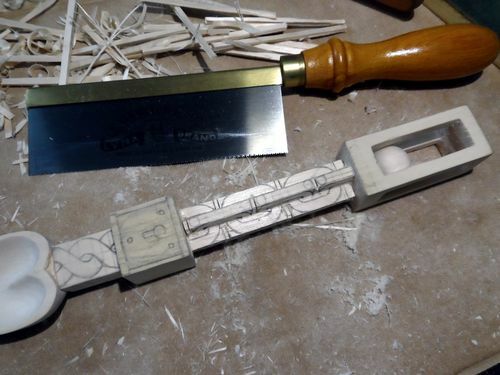 Again, it could all have been done with the knife alone, but the gouge made things go a little quicker. I took great care not to slice into (and therefore weaken) any of the links. Lindenwood is quite brittle and will easily split if you exert too much pressure. I was very conscious of this fact and only used light strokes, stropping my knife to keep it razor sharp as I went along. By the time I’d released the third link I had established a process and I thought you might be interested to see what that method was. You have to bear in mind that all of the stages involved both hands, but in the photos below I can only show one hand at a time since the other one is holding the camera. 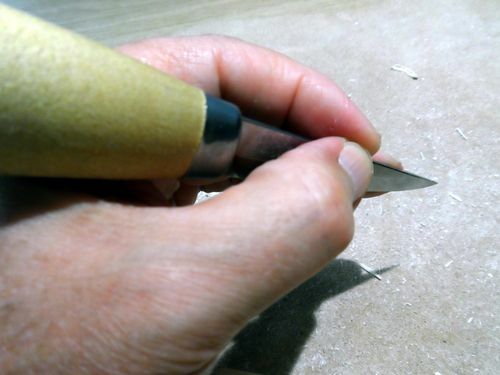 Whatever tool I was using to do the cutting, my free hand was pinching the next link as shown below. 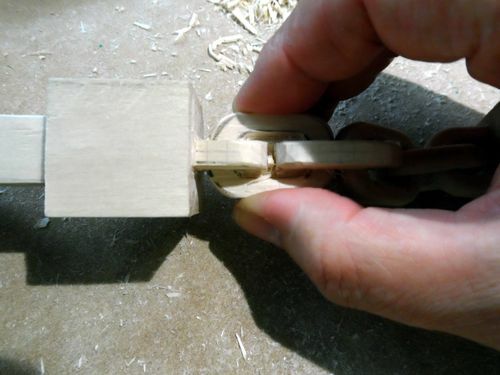 This was to both steady the work and help prevent the brittle wood from splitting as I cut. 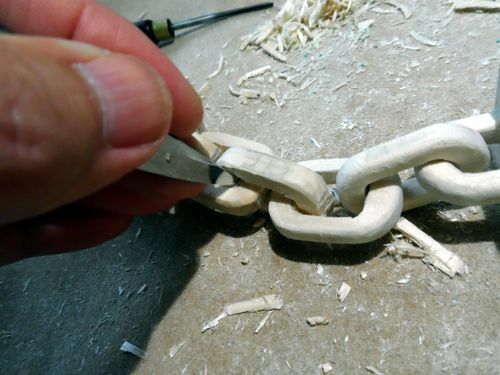 ...or used my knife to sever the grain between the links. For this step, I pushed the point in and just pulled it back slightly a few times then rotated the chain 90 degrees and repeated the action. I kept turning and cutting until the next link was free. Although I couldn’t see what the knife was doing, I could feel the fibers being severed. Here’s a better photo of how I held my knife for maximum control. As you can see I really choked up on the blade, but with the handle resting on the back of my hand it was actually a very safe grip because there was no way the sharp edge could cut me. So far on this project I haven’t drawn blood, but having said that I’ll probably cut my finger off next week. LOL. 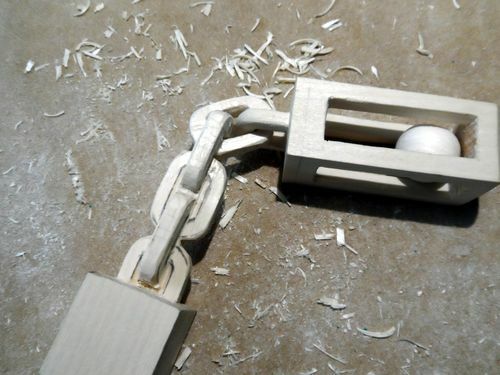 Eventually all the links were free and rough sanded. 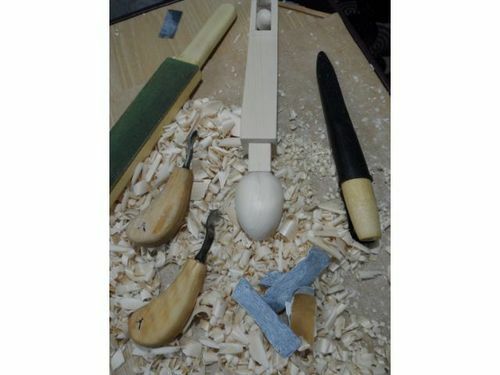 There is still some refining work to do on the links to shape them and equalize them, but the finish sanding will all be done in one session at the end of the project so I don’t make it dirty again whilst handling it. 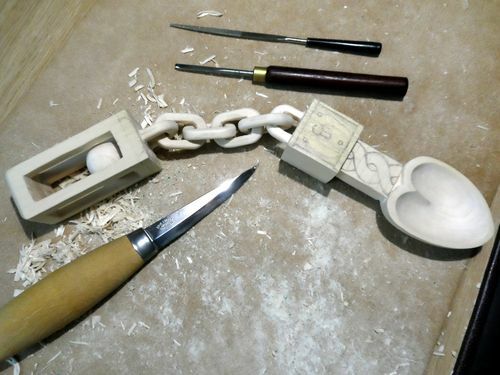 So there you have it, my first ever carved chain and I’m pretty relieved that I got through it without incident. Next week, I will DEFINITELY be doing the padlock and hopefully the twisted stems if I don’t have to work late. Thanks for following my hotel woodworking exploits. I hope you’re finding it interesting. Quite impressive Andy. By now I would have had a pile of splinters, a cut or two in my fingers and a sore throat from ;-) Can’t wait for the next installment. Nice work on that ball and chain. Great work and as usual great photos to show how it’s done ! Brit, Just stumbled onto this portable project. Very ambitious! An you are executing it with due patience and precision. Very skillful! 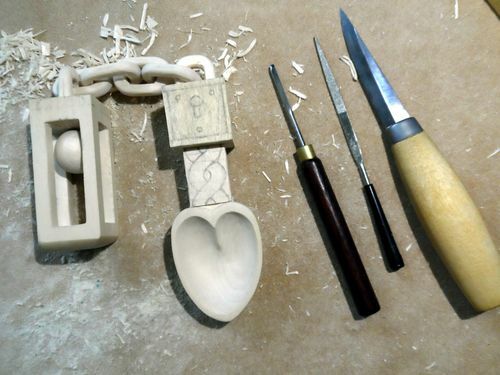 Spoon carving is on my bucket list, and this type of work intrigues and challenges my imagination. I’m gonna lurk…K? -- Dan Krager, Olney IL http://www.kragerwoodworking.weebly.com Any flattering photo of yourself will at some point elicit the comment that it looks nothing like you. I’m having fun watching your progress. Thanks for sharing! Kevin -You do need a lot of patience to do this kind of stuff and it is frustrating at times when I know I have the ideal tool for a particular task at home but I didn’t bring it with me. I do believe that there is a lot of benefit to be gained from restricting yourself to only a few tools and learning to make them do what you want. Don & Glen – Thanks guys. Dan – Lurk away my friend. I’m having a blast doing all these little projects that I wouldn’t otherwise have time to do. I don’t put any pressure on myself to get a project done by a certain time and if I don’t feel like doing it one night, then I don’t. Sras – Thanks for looking in. Glad you’re enjoying it. This is really inspirational Andy, I’m really impressed at how much can be accomplished with that knife. I’d like to try the is one day. You are an inspiration Andy, love to watch the progress. Thanks for lessons and all the photos; I’m attempting this soon. I cannot imagine trying what you’ve just accomplished for the first time sans bench, a few clamps, and all the other tools watching over my shop. Cheers to your efforts! Fascinating. Such a wonderful blog as well. I am really enjoying this; thank you very much Andy! 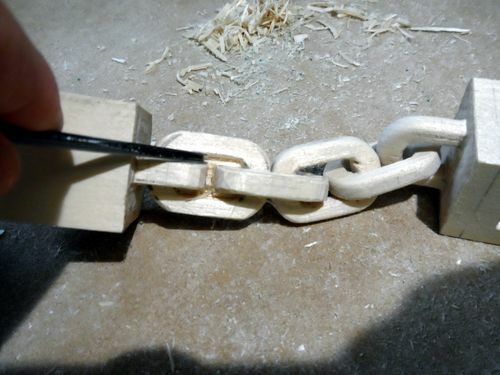 When I was a young boy, a friend on my dad’s carved a chain for me with a hook on the end. Fascinated, I tried one on my own, but stopped after a couple of blisters appeared and never took it up again. How much length did you gain after the chain was finished? 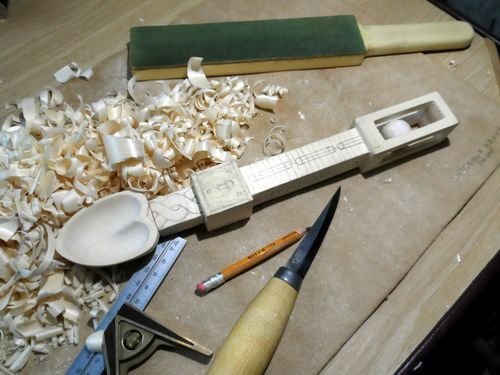 Andy, this is going to be a beautiful spoon. And thanks for the great blog on this. Mauricio & Rilanda – Glad you both feel inspired. Mauricio, this is my fourth project using that knife as the primary tool. The first project I kept cutting myself and it felt really awkward, the second project less so but I still drew blood. In the last two projects that knife has quickly become an extension of my arm and I find myself changing between the different holds without even having to think about it now. It is amazing what you can do with just a knife and a bit of imagination. Terry – I can’t wait to see what you come up with. With your patience and hand tool skills I just know it will be something special. Tony – I’m really enjoying this project. Lots of little challenges that feel me with trepidation and then satisfaction once I’ve overcome them. At the end of the day though, these projects are a great way to push myself because if I screw up all it has cost me is a few hours of my time. Duck – Sounds like it is time to try it again. :o) The block of wood was 12” and now it is 3/16” longer. It will grow a bit more when I come to finish sand the project. Dan – That made me chuckle, but I managed to keep my response clean. Charles – Thanks. I’m having a blast.